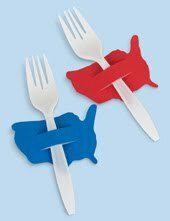 If you are looking for a cute way to dress up your plastic utensils for a summer barbecue, check out these summer utensil holders. Kate has created this fun PDF with shapes that are great for the 4th of July and any other summer barbecue. It contains a map of the US, a star, a tomato slice, hot dog in a bug, and a fun red and white checkered picnic napkin. You can download the PDF for these fun summer picnic utensil holders over at Kate's Paperie. Now this is awesome!!!! I'm sooo doing this!